ST. PAUL, Minn., Aug. 30, 2018—NFIB Minnesota PAC, the political action committee for the state’s most influential small-business group, today announced its endorsement of challenger Jeff Dotseth over incumbent Mike Sundin in the District 11A House race. “Jeff Dotseth scored a perfect 100 percent on the NFIB candidate questionnaire and has a great commitment and concern for small business,” said Mike Hickey, Minnesota state director for NFIB. “He is a small-business owner and an NFIB member. He supports funding our massive state government without additional general tax increases, and he supports critical tax conformity measures for small businesses and farmers, including significantly increasing or conforming to the new federal section 179 deduction limit and the new federal estate tax exemption. 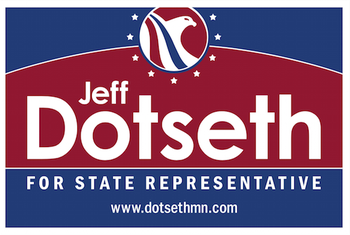 He also supports a badly needed preemption bill and many other positive initiatives for small business.” Dotseth is the owner of Jeff Dotseth and Associates Realty in Zimmerman. “In stark contrast, his opponent, Rep. Mike Sundin, made many votes detrimental to small business,” said Hickey, “including a surprising vote against the significant 2017 tax reduction/reform bill that was signed into law by Gov. Mark Dayton. This is one of the few positive tax bills that passed during the eight-year, Dayton era. It contained a significant small business property tax reduction, a $1 million increase in the estate tax exemption, and a badly needed 40 percent property tax credit for farmers on the portion of their property taxes that are attributable to school referendums. “Other disappointing votes he made included opposing the new re-insurance plan that the Legislature was forced to pass on an emergency basis to save Minnesota’s individual health insurance market, and votes in opposition to a badly needed preemption bill that will prohibit local units of government from enacting minimum wages higher than the state wage. 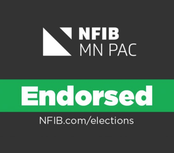 The endorsement of Dotseth by the NFIB Minnesota PAC is based on positions taken on key small-business issues, including health care, taxes, labor, and regulations.